Cute Animal Art, Animal paintings and illustrations, and Animal artists: "Butterfly Taxi" - featuring cute Miss Mouse and anthropomorphic flowers too! 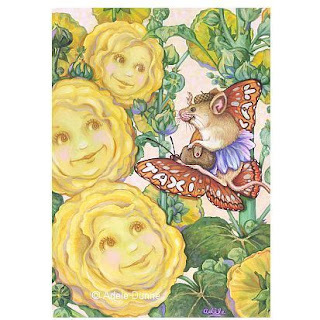 "Butterfly Taxi" - featuring cute Miss Mouse and anthropomorphic flowers too! Here's my latest painting, "Butterfly Taxi." I had a lot of fun with it because not only does it feature the well-traveled and VERY cute Miss Mouse, it also has another (rather obscure) subcategory of anthropomorphic art, flower faces. Flower faces are a real challenge - their faces must be "real" enough to be expressive and believeable, but at the same time the artwork must still be true to the flower being depicted. These three little ladies - Molly, Holly, and Dolly - are the Hollyhock sisters. They are, botanically speaking, double hollyhocks. In reality, they would have more ruffles, but then it would have been more difficult to integrate the faces. If you go to the Gallery at my Whimbletails™ website, you'll see I've also done a flower face rose and sunflower. 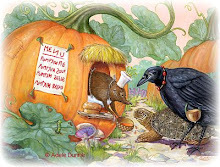 To visit my online store offering a large variety of great products, gifts, and collectibles featuring all my whimsical animal illustrations, please go to Adele's Cute Animal Art Shop.